Libyan State TV Talk Show Not The Usual Propaganda Instead of images of Moammar Gadhafi set to patriotic music or lengthy anti-NATO diatribes, the host of one Libyan television program says he styles his talk show after Johnny Carson and Larry King. Experts say its entertaining nature could help persuade Libyans to support Gadhafi. 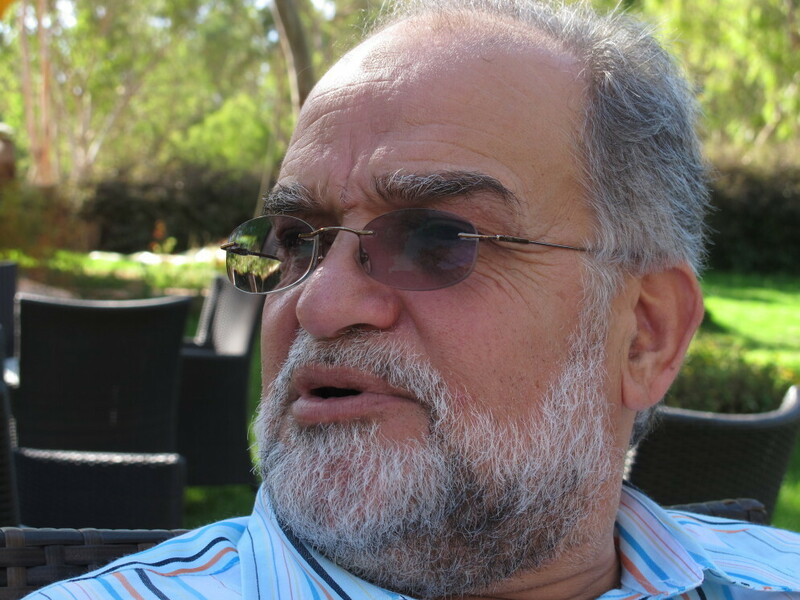 Yosif A. Shakeir is host of Ashem al-Watan (or "Hope of the Nation"), which is seen on the Libyan state TV channel. The show is using the airwaves in Libya to keep hope for Moammar Gadhafi's regime alive. There's a war Libyan leader Moammar Gadhafi is waging in addition to the one against Libyan rebels and NATO: a propaganda war on the airwaves. His goal is to persuade Libyans to support him, and his top commander in that effort is a U.S.-educated political scientist. The Libyan pundit hosts a nightly show broadcast from Tripoli that he claims is styled after some of America's most popular television programs. The show, called Ashem al-Watan, or "Hope of the Nation," isn't your usual Libyan television fare. Instead of lengthy anti-NATO diatribes by commentators or images of Gadhafi accompanied by patriotic songs, the program's host, Yosif Shakeir, prefers to get his message across using a talk show format. Recently, he featured several American guests who denounced the international campaign against Gadhafi as misguided. "I want to say something: Our spirit never dies because of these nice people supporting us, the people who love liberty and freedom; they are with us tonight," Shakeir said on his show. One of the Americans, introduced as Lucy Gryder Bradley, sums it up with this comment: "I'm a mother, a grandmother and a great-grandmother, and I am here to support the Libyan people," she says. "I stand for peace, not war." I never talk about anything without documents. This is why the people like the show. A portly man of 60 who runs a translation business, Shakeir says he never had any intention of becoming a TV personality, let alone running a two-hour show every night. But following the February uprising in Benghazi, Shakeir says he felt he had to do something to combat what he and other Gadhafi supporters believe is biased reporting in the foreign media, especially on Arabic-language channels like Al-Jazeera and the U.S.-funded Alhurra. Shakeir says he decided to take information he has accumulated over the years against former Libyan officials who now oppose Gadhafi and present it on air. "I show ... the checks, money," Shakeir says. "I show one of the defected guys, how much he got — like the ambassador in Washington, like the ambassador in the Arab League in Cairo. I never talk about anything without documents. This is why the people like the show." Shakeir says he wants to make the show entertaining, too. He says he's tried to adopt the styles of Larry King, Ted Koppel and Johnny Carson to deliver his message to Libyans who tune in. Experts say that format could help Gadhafi in his struggle to stay in power. "The mass media in any country, especially in the dictatorial countries, serve as agents of control by the regime," says Yahya Kamalipour, the head of the Department of Communication and Creative Arts at Purdue University Calumet in Hammond, Ind. "And of course, entertainment is the best vehicle and the most effective form of propaganda." But Libyan dissident Saleh Gouda, a former friend of Shakeir's, dismisses the show as nothing more than a vehicle for character assassination. NPR spoke to Gouda by Skype in Northern Virginia. "For sure [it's] propaganda; a lot of stories are fabricated stories about the people," Gouda says. "They used to be ambassadors and ministers with Col. Gadhafi and after [that] ... they changed their minds and [went to] the other side of the Libyans." [A] lot of stories are fabricated stories. ... They used to be ambassadors and ministers with Col. Gadhafi and after [that] ... they changed their minds and [went to] the other side of the Libyans. For his part, Shakeir speaks openly of his time with Gouda and other Gadhafi opponents. He says he joined the National Front for the Salvation of Libya, which opposed Gadhafi's rule and sought democratic reforms. But Shakeir says he switched sides in the mid-1980s because of the front's cooperation with the CIA. How popular his show is cannot be objectively measured in a country where minders manipulate information, but it's clear the TV host has fans — like one group of protesters who argued with foreign journalists in front of the Rixos Hotel in Tripoli. "I like Shakeir because he's telling the truth, and giving facts with proof," says one protester who says his name is Assad Ali. Shakeir says he will continue with his show until the war is over.